Blog Posts - Welcome to REAL FIT with BROOKE B! Was anyone else FREAKED OUT by the revelation of a possible link between baby powder (talc) and cancer?! I know I was! And whether or not the science backs it up (the jury is still out), it got me thinking, not just about applying talc to my body or using it as a dry shampoo, but even just breathing it in as it wafts around the bathroom (I have allergies...). I use baby powder a lot. I mean almost every day. So, a fire was lit under me to find an alternative option. I wanted to find something that I could make at home so I would know what I'm dealing with. ​Well, I found a solution. Its cheap and easy, and can be put together in no time! I just wanted to share my little recipe with you here in case you find yourself in the same position. I used arrowroot powder, but I've also heard of people using corn starch. I opted for arrowroot because it has loads of nutrients in it and it's not harvested with chemicals. So, I just grabbed some arrowroot and my favorite essential oils and voila! Instant 'baby powder'. I used 6 drops of lavender and 2 drops of ylang-ylang. It works great and it smells so good!! Let me know if you try it too!! BLACK FRIDAY SALE (THROUGH THE WEEKEND)! GET 50% OFF GROUP COACHING!! Save 50% on Group Coaching! This is only on for the weekend so act now! Congratulations if you reached those goals! You probably wake up feeling more joyful going into work. At 2:30, while your coworkers drop like flies, you have plenty of energy. In the evening, you have a clear mind for laughing with loved ones. Every day truly is better than the last. Take a deep breathe and forgive yourself. You’re human. You’re also resilient. It’s okay that you aren’t exactly where you want to be yet. You still learned a lot about yourself this year, which is a huge accomplishment and should be celebrated! And your life isn’t over yet so promise me this… you won’t give up! You WILL keep going. FitLife has an incredible Coaching Program that is formulated to help you reach your individual goals and aspirations in health and fitness - complete with support and guidance from our Fitlife Certified Coaches and other community members with the same goals and mindset as you! To be happy, live a vibrant, fulfilling life and THRIVE in their best health. It’s possible and I want to help you get there! With the FitLife coaching program, you will have ME to hold your hand, provide encouragement and support. You will have me as a mentor to go through the ups and downs with you. You will have a tight-knit group of wonderful, inspiring people to talk to and share ideas with. The Fitlife.tv team and I will be there for you. We can help you - and we WANT to help you! If you are done with all the quick fixes, pills, shakes, and disappointments, and want to learn the tools to transform your life for the better, then act now. This time, you won’t be alone in this journey, you'll have me to guide you. Set yourself up for success in 2016! 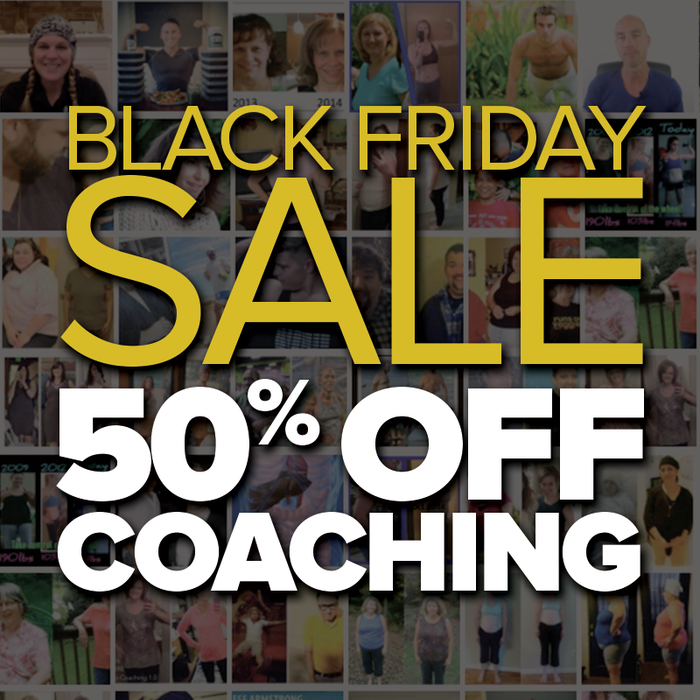 Commit to Group Coaching NOW and SAVE 50% - Happy Black Friday! Good News: The Fitlife coaching team is able to accept twice as many clients this year! Yes - we're growing the program because of last year's success and the great results our clients want more of. Last year 50 students saved 50%. This year we are offering that savings to the first 100! Bad News: We sold out within hours last year. Once we fill the first 100 seats, we will be sold out again. Please click here to discover more. We’ll be waiting for you. I can’t wait to celebrate your victories along the way. P.S. I kept losing weight and gaining it back until I found someone to be accountable to. Do you believe that there’s something very moving about community? Do you believe that there is strength in numbers? I certainly do. Make this your best gift to yourself in 2015. I hope to see you in our program in 2016. Enroll now.